The following bus and light rail service changes will take effect on Monday, October 8. The weekday Express light rail service will be discontinued. Extra cars will be added to regular trains to handle capacity as needed. Line 180: Buses will operate with no stops between the Great Mall Transit Center and Warm Springs BART via Hwy. 880. Service will operate only during peak hours: 6 a.m. to 9:30 a.m. and 4 p.m. to 7:30 p.m. Midday and evening service will be discontinued due to low ridership. AC Transit Line 217 now operates between Great Mall and Warm Springs BART seven days a week. Line 181: Weekday buses will operate with no stops between San Jose Civic Center and Warm Springs BART. NOTE: Express Bus Lines 120 and 140 will continue serving Fremont BART. Minor weekday schedule changes will be made on the following routes:14, 16, 17, 18, 19, 23, 37, 40, 53, 54, 55, 58, 60, 64, 66, 68, 70, 72, and 522. Minor weekend schedule changes will be made on the following routes: 12, 22, 23, 40, 54, 60, 64, 66, 68, 70, 72, and 522. 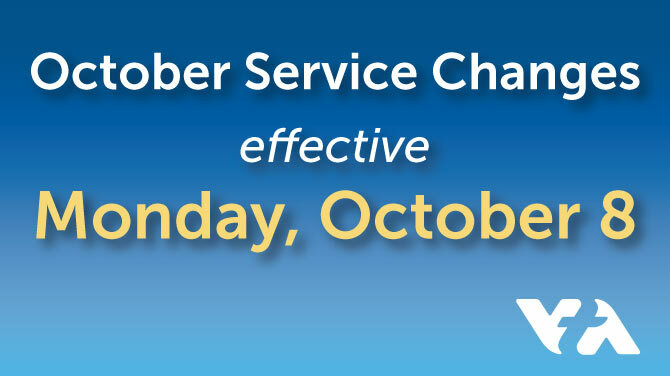 Email customer.service@vta.org to have new schedules mailed to you.